Vacation Property Management Services for Property Owners and Vacation Guests. Up and down the rugged landscape of California’s Eastern Sierra you’ll be hard pressed to find a more charming village than June Lake. The authenticity of the area and the vacation properties we manage are big reasons our vacation guests return for vacation year after year. This also explains why many of our vacation guests purchase a second home in June Lake. Catering to this dynamic, at June Lake Accommodations we strive to provide the attentive services and a personal touch that contributes to keeping our vacation community very special. Whether summer, winter, spring or fall, the beauty of Sierra Nevada Mountains around June Lake is almost beyond comparison. Yet, this beauty also demands that you stay on your toes as conditions can change literally overnight. But that is why we love it. And chances are why you do too. So if you are looking for a weekend shredding the slopes of June Mountain, or a week long vacation during our spectacular Sierra summers, consider not only our vast options but our experience as well. If you are looking to hire a vacation rental management company for your property we would love to catch up with you and explain our services in further detail. We look forward to hearing your unique needs and custom tailoring a plan that will work for everyone involved. We deliver higher occupancy rates and an easy going staff that will put any concerns you have to rest through our strategic approach and professional experience. As a progressive property management firm, we have a state-of-the-art and high-ranking reservations website that is loaded with fantastic June Lake stories and articles. Our property owners even have their own private portal into our website, that delivers financial and billing data directly to the owner, and lets the owner book his/her own property when it’s time for a personal vacation. If you are considering visiting the Eastern Sierra its authentic charm, look no further than June Lake. With the largest selection of vacation properties along the June Lake Loop, we can offer you a warm welcome, personal service and a beautiful cabin, condo or home. We have charming one bedroom A-framed cabins, three story rentals with deluxe amenities, and condos with a fantastic view of an alpine lake. 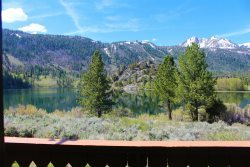 If your vacation plans include a weekend shredding the ski slopes or a weeklong vacation in pursuit of trophy brown trout, come to June Lake and let us provide the accommodations that will keep you returning year after year. And if your property investment plans include a vacation condo, home or cabin in June Lake, give us a call today and take advantage of our family approach to property management and trusted relationships.